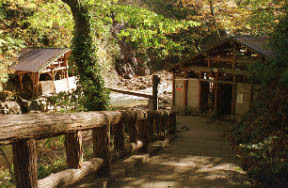 If it is called a geto, there are images, such as why or aloof and proud independent Mine.Although it is not also a hidden hot spring of the Separate from main from northeastern backbone, but an isolated lodge, there is presence made into the irremovable.It may be coming from the history of a storied hot-spring cure built for the reason of the spring quality of rich efficacy in which a mineral-rich sediment deposits in large quantities, and the noted-spring group with which a geto river is dotted.It is said that the east was called geto in the Founded or started to use this hot spring of the Kamakura period and about 850 years ago, and the hot spring ranking of the Edo period if the west second highest rank in sumo was Yunomine.The hot spring in the heart of the mountain surrounded by included geto Miyama in northeast one hundred famous mountains is still used as a spa resort, and is a hot spring of the 1st class also as hidden hot springs, such as a steam bath in cave. 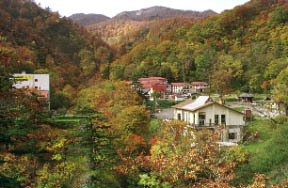 The spa resort surrounded by geto Miyama. 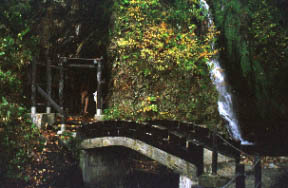 A steam bath in cave and a Ja-no-yu fall. The hot spring of a gypsum-fibrosum spring wells ups from here and there [ of the depth of about 10 m, a ceiling or a bottom ], and a mineral-rich sediment seems to be a limestone cave.Become less hot just for a moment..
A promenade is traced back to along a branch from before a Geto sansou, and it is about 5 minutes.The calcareous sinter which shines in a light was mystical night. 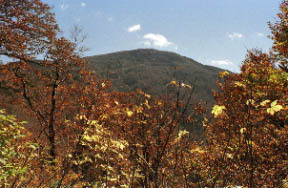 * Especially since it is easy to slide on head lamp bringing and a night journey, please take care. 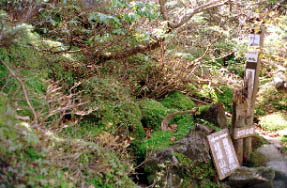 The garden in which the eighth stage of a scripture mound becomes mossy "garden of a tsubo"
Although the suspension bridge built over a trailhead and a geto river in a path through a wood from a geto in about 1 hour is crossed and there is a chain place at first, if the rest will enjoy "a garden which is a tsubo" like the mountain trail where a beech forest continues, and the Japanese style garden where care was prudent if that is crossed, and it escapes from a lignosa belt, a view will open at a stretch.A geto to a scripture mound round trip is about 7 hours. The Lysichitum camtschatcense and the Iwakagami from the end of a May, Shirane-Aoi Umebachi-so Miyama-daikon-so Hosobaiwa-benkei Kome-tsutsuji Miyama-usuyuki-so Yotsuba-shiogama Miyama Shiogama, etc. Sodium calcium salt ghost spring. A cave steams and it is a bath (no charge).